The person behind Arc Angel is the talented musician, songwriter, and producer Jeff Cannata from Connecticut. 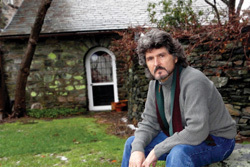 His musical career dates to the mid-Seventies, the first Arc Angel project from 1983 with many solo efforts on a variety of labels around the world following. 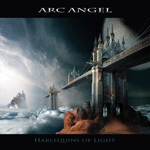 Cannata returns to Arc Angel with the new Harlequins of Light, now signed with Frontiers Records. Jeff Cannata: the man behind Arc Angel outdoors. Those familiar with Cannata's career can basically expect what he's very good at it: melodic rock touched with a little progressive rock and wrapped in a AOR wrapper. He handles lead vocals, of course, but also lends his hand to drums, bass, keyboards, and guitar, though most leads are done by several others, from a supporting cast of musicians. With one spin of Harlequins of Light you find the strengths of Arc Angel: Cannata's fine song composition and smooth vocals. To the former, you get a big symphonic anthem with the title track; a catchy light rocker in As Far As The Eye Can See; the more steady, sometimes heavier, Voice of Illuminati; the West Coast sound of California Daze and Tonight Forever; and, the slight jazz feel of Amnesia. That last song has one of the best drum lines on the album from Cannata. Throughout, Cannata's lead vocals and vocal arrangements are a pure pleasure being clean and smooth, melodic and harmonious, things essential to AOR melodic rock. This album also contains a new version of Fortune Teller from his first solo effort Images of Forever. Harlequins of Light is simply a solid and entertaining album of AOR melodic rock. Hopefully, Cannata will stay with Frontiers and return with more in the future. Easily recommended. Arc Angel's Harlequins of Light, from musician Jeff Cannata and company, is simply a solid and entertaining album of AOR melodic rock.